Trump Tariffs On China, Immigration Crackdown Have Mixed Impacts On Garlic Town Gilroy, Calif., is known as the garlic capital of the world. Two Trump administration policies — one on trade, the other on immigration — are affecting the town in starkly different ways. 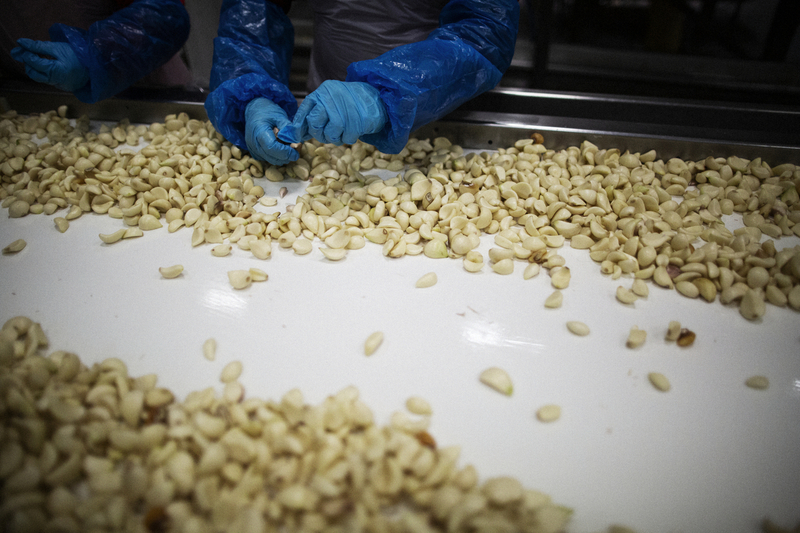 Workers pull out cosmetically defective garlic (that will be processed separately) at the Christopher Ranch processing plant in Gilroy, Calif. About 6 percent of its garlic is bought from China; the rest is homegrown. Gilroy, Calif., is known as the garlic capital of the world. And two Trump administration policies — one on trade, the other on immigration — are having a mixed impact on this agricultural community south of San Francisco. It's about 50 degrees outside, but for a moment it looks like it's snowing. But the morning air is pungent and savory, and those flakes falling from the sky are garlic skin pieces, drifting away from the peeling facility. Christopher Ranch in Gilroy is the largest garlic producer in the country. Ken Christopher, executive vice president, says it didn't always look this busy. In the 1990s, he says, the industry was hit hard by cheap Chinese garlic imports. 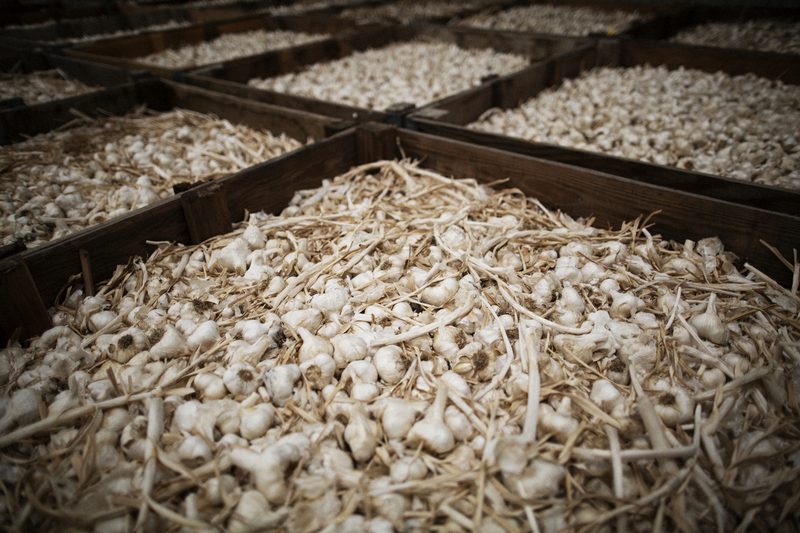 "U.S. garlic was trading around $40 a box in the 1990s," he says. "Chinese garlic flooded the market at $10 a box, and it severely undercut a lot of U.S. growers." Gilroy is known for its garlic, but only a few farms survived. Christopher Ranch was the biggest. Ken Christopher says about 6 percent of its garlic is bought from China; the rest is homegrown. 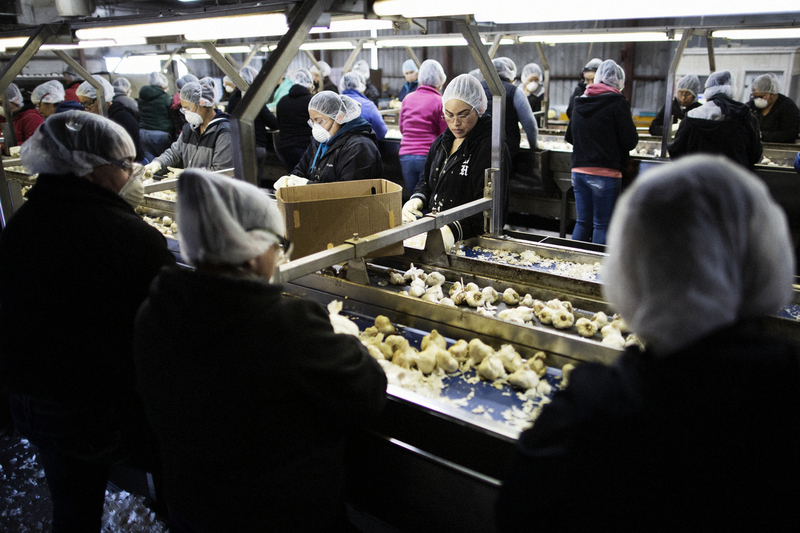 Workers sort out defective garlic at the Christopher Ranch plant. The company employs more than 1,000 people. "It was really hard," he says. "We're talking reduction in workforce, we're talking reduction in work hours, we had furlough days simply just to get through the year." This struggle went on for years. Then, in 2016, Donald Trump was elected president. And his stance on Chinese imports was pretty clear: tax them. Christopher flew to Washington last year to testify in favor of tariffs on Chinese garlic. They would mean that Chinese garlic at your supermarket would be way more expensive than U.S.-grown garlic. When Christopher talks about tariffs, his face lights up. He says ideally, Chinese garlic would be taxed at rate over 400 percent. In the end, the Trump administration went for a 10 percent tariff. Christopher remembers when it was announced: "My coworkers and I started texting each other, emails started flying back and forth. A coworker of mine actually got me the flag that was flying above the U.S. Capitol the day they got enacted." 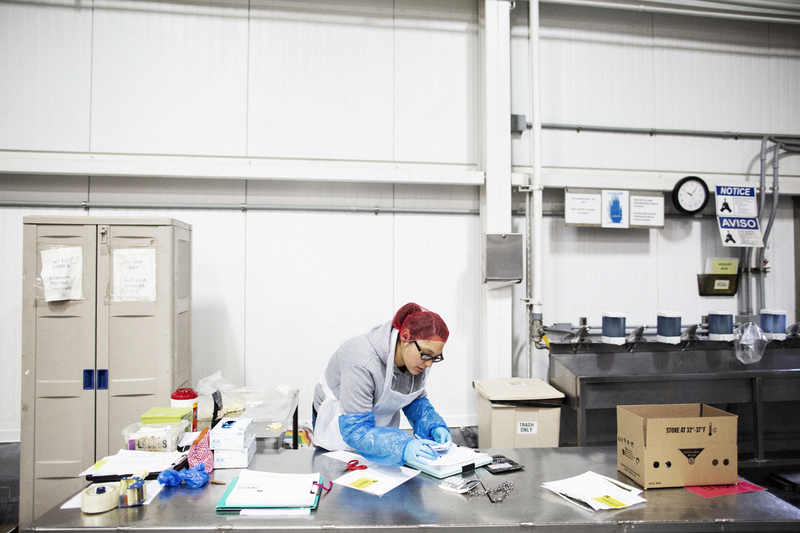 A worker at the plant pulls garlic samples for testing. The Christopher Ranch company saw demand for its garlic grow amid U.S. tariffs on Chinese garlic. For many American farmers, who export a large amount of their produce, the tariff war with China has dealt a big blow. Christopher says he is very sympathetic to their plight, and he doesn't think tariffs are a long-term solution. But they are certainly helping. Christopher Ranch said sales were up by about 20 percent last year. The company even had to pull garlic from storage to meet increased demand. But like most American agriculture, immigrants are a big part of Gilroy's labor force. And the Trump administration's crackdown on undocumented labor has hit many California farmers hard. 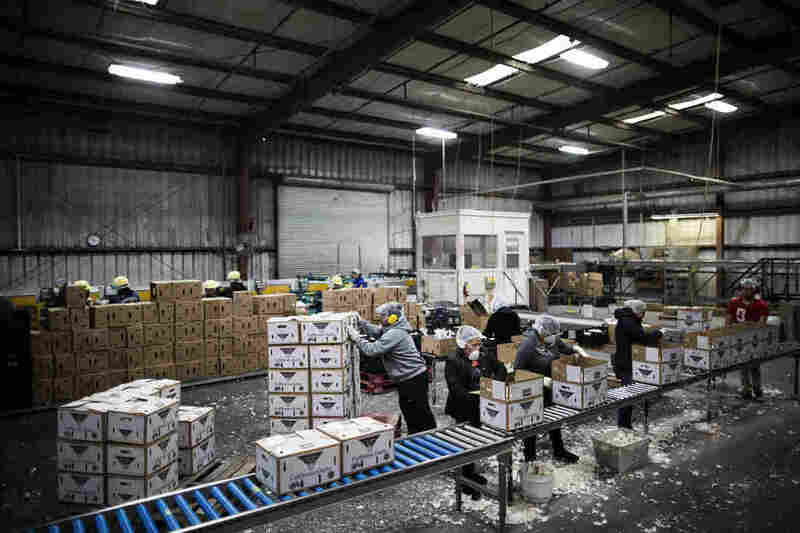 Workers pack garlic into boxes at the plant. Ken Christopher, the company's executive vice president, said that when the Trump administration announced tariffs on China, "My coworkers and I started texting each other, emails started flying back and forth." Christopher says he thinks about this all the time. "If the Republican Party is pro-business, if they want to support industries across the country, they need to realize that immigration is a critical function of that," he says. Gerardo Barba, an outreach coordinator for Catholic Charities, says the mood here has changed. "Just in general, there has been a lot more fear ... just fear to be out in public," he says. Barba says he's "started noticing changes recently with the higher amounts of actual arrests that ICE conducts — generally going to people's homes, knocking on the door." Driving through Gilroy, it's clear that town has close ties to Mexico. The streets are lined with taquerias and discotecas, and sites on the outskirts of town house migrant workers. Christopher Ranch currently employs more than 1,000 people. One man who packages garlic there tells NPR they're great bosses. He gets paid $15 an hour — a solid wage for a farmworker. He recently got his green card. He asked that his name not be used because he has family members who are undocumented and are worried about getting deported. If that happens, they've asked him to take care of their children. He says even though business is booming, there's a lot of fear. And he wonders: If enough people get deported, who's going to harvest all that garlic? Garlic sits in bins before being processed at the processing plant. 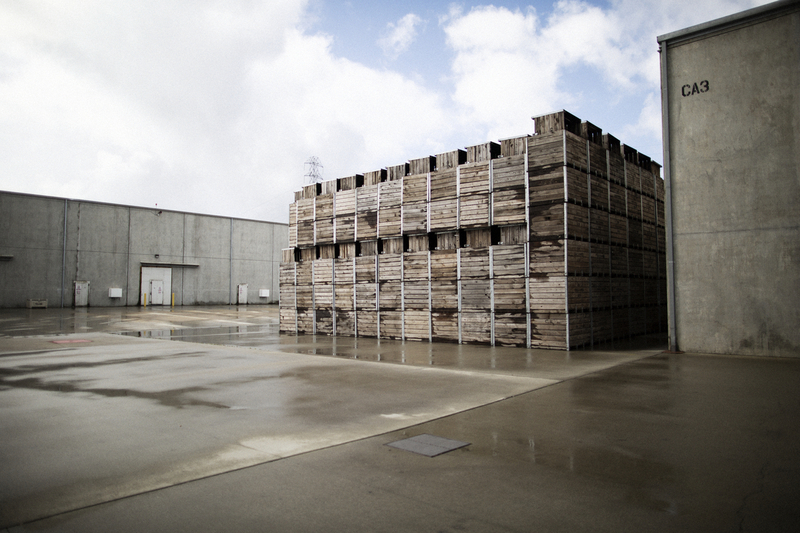 Cold storage (left) and empty garlic bins at the plant.